Mugwumps Magazine Back Issues & Catalog Reprints, Etc. 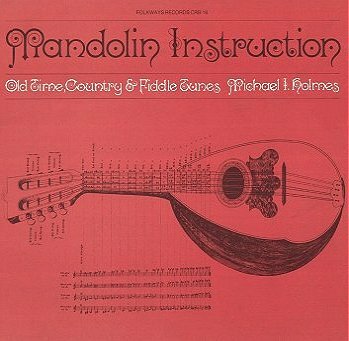 Mandolin Instruction Old Time, Country & Fiddle Tunes by Mike Holmes. First released on Folkways, it has been re-released, as a book and CD set, by Smithsonian-Folkways. Click for tune list. 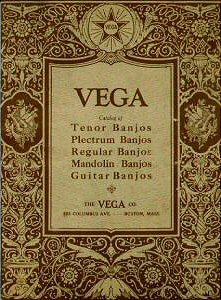 1923 Vega Banjo Catalog New old stock copy of this excellent reprint with 5 string, banjo mandolin, banjo guitar, tenor, and plectrum models. 32 pages showing Senator, Regent, Imperial Electric, Whyte Laydie #2 and #7, Tubaphone #3 and #9, and Tubaphone Deluxe, several models of 4 and 8 string banjo mandolins, all models of tenors, plus several models of orchestra (plectrum) banjos and banjo guitars. Complete descriptions and testimonials make this a valuable and sorely needed document for identifying and verifying vintage Vegas of the 20s. Long unavailable, don't miss this one. $20. 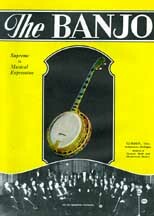 1927 Gibson "The Banjo" catalog. Full color reprint with lots of period photos of banjo players and drawings of banjos. Color photos of Bella Voce and Florentine models with 4 different color schemes for each! Also covers the banjo's possibilities in "Radio and Recording, The School Orchestra, Dance and Concert, The Soloist, The Home." Fun stuff, with detailed descriptions of the banjos, 24 pages, $20. 1896 SS Stewart Banjo c+atalog. Excellent, accurate, used reprint with pictures of all the models offered at the time, including some of his Presentation model plus period cuts of banjo players and drawings of accessories. 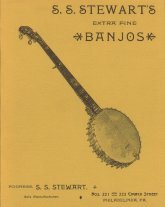 With detailed descriptions of each of the banjos, letters of testimonial, words of wisdom from SS Stewart himself, and the original, authoritative instructions for putting on a new, skin, banjo head -- complete with pictures. 56 pages, $100. Bluegrass Time: A Musician's Photographs of the Early Days of Bluegrass Festivals. 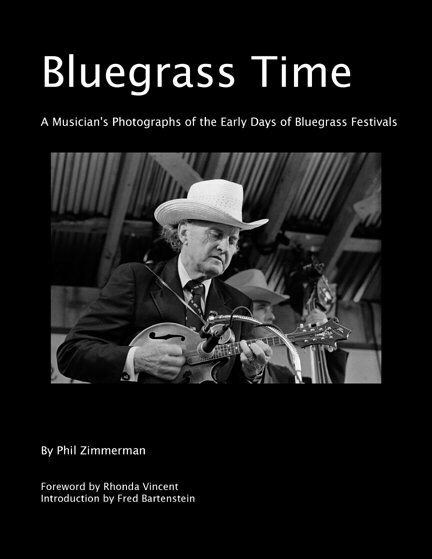 By Phil Zimmerman, featuring photographs taken between 1972 and 1984, the book documents the passing of the torch from the first generation pioneers of bluegrass to their successors, who include some of today's top performers. High-quality rphotographs of this famous bluegrass photographer's pictures of bluegrass greats, including Bill Monroe, Ralph Stanley, Del McCoury, Sam Bush, Emmylou Harris, Curly Ray Cline, Marty Stuart, Lester Flatt, John Hartford, Don Reno, Sonny Osborne, Bobby Osborne, David Grisman, Peter Rowan, Butch Robins, Frank Wakefield, Ricky Skaggs, J. D. Crowe, Charlie Waller, Tony Rice, Doyle Lawson, Bill Keith, Bela Fleck, Tony Trischka, Vassar Clements. Includes essay by the artist/author on his experiences at the first multi-day bluegrass festival in Fincastle, Virginia, in 1965. Soft cover. 64 pages. Book is New; not a remainder, $25. Mandolin Instruction, Old Time, Country & Fiddle Tunes by Mike Holmes. First released on Folkways, it has been re-released by Smithsonian-Folkways. All tunes played slowly and up-to-speed solo, plus all tunes played in a stringband setting (Reed Martin plays banjo, Mike Rivers on guitar) with mandolin on separate track so you can play along with just the accompaniment. 44 page book contains tablature to each tune, plus dozens of vintage photographs and ads. Click for tune list, $35. Excellent graphics and interesting information. V5#1-6, 1976. In new, unread condition. Size is 5.5x11". Complete and unused set from this transitional year when Mugwumps began using 2 color covers. The last year of the folio sized issues. $36.00 sold as a complete set only. V1#1-6, 1972. In new, unread condition. Size is 5.5x11". Complete and unused set of the first year of this influencial magazine, now a collectible itself. This is the LAST of these six magazines. Don't miss this final opportunity to complete your collection. Once they are gone, there are no more. $300 sold as a complete set only.